Every day, our hearts say, “I LUB you!” From the superior and inferior vena cava to the atria and ventricles, explore with us the blood flow order through our hearts in 14 easy steps. Come also learn with us the heart’s anatomy, including where deoxygenated and oxygenated blood flow, in the superior vena cava, inferior vena cava, atrium, ventricle, aorta, pulmonary arteries, pulmonary veins, and coronary arteries. To gain a visual step-by-step understanding, check out our quick and easy video on the blood flow pathway through the heart in less than 90 seconds. Please notice that blue represents deoxygenated blood, and red represents oxygenated blood. In summary from the video, in 14 steps, blood flows through the heart in the following order: 1) body –> 2) inferior/superior vena cava –> 3) right atrium –> 4) tricuspid valve –> 5) right ventricle –> 6) pulmonary arteries –> 7) lungs –> 8) pulmonary veins –> 9) left atrium –> 10) mitral or bicuspid valve –> 11) left ventricle –> 12) aortic valve –> 13) aorta –> 14) body. Thank you to our member Emily for creating and submitting this ‘lub’-able animation to us! The vena cava is the largest vein in the body that delivers oxygen-poor or deoxygenated blood to the right atrium of the heart. The superior vena cava comes from the upper part of the body, including the brain and arms, while the inferior vena cava comes from the abdominal area and legs. The atria are the top two chambers of the heart that receive incoming blood from the body. The right atrium receives deoxygenated blood through the superior and inferior vena cavas from the body and pumps it to the right ventricle through the tricuspid valve, which opens to allow the blood flow through and closes to prevent blood backing up the atrium. The left atrium receives oxygenated blood through the pulmonary veins from the lungs. It pumps the blood through the mitral valve to the left ventricle. Attached to the atria are the pouches called auricles that expand to allow the atria to include more blood volume. The ventricles are the two lower chambers of the heart. The right ventricle receives oxygen-poor blood from the right atrium and pumps it through the pulmonic semilunar valve to the pulmonary artery and into the lungs to be filled with oxygen. On the other hand, the left ventricle receives oxygen-rich blood from the left atrium and pumps it through the aortic semilunar valve to the aorta to deliver the oxygen to the rest of the body. The pulmonary arteries deliver oxygen-poor blood from the right ventricle of the heart to the lungs, while the pulmonary veins deliver oxygen-rich blood from the lungs to the left atrium of the heart. The aorta is the largest artery in the body that leads from the left ventricle of the heart to the rest of the body. It carries oxygen-rich blood to deliver to the body’s cells. As an artery, it contains thicker walls than veins because it has to withstand the tough pumping blood pressure of the heart. The coronary arteries are a set of arteries that branch off the aorta and are located on the heart.They carry oxygenated blood and nutrients to nourish the heart tissue cells. When the coronary arteries are clogged by excessive fatty tissue in cholesterol, it can lead to a lack of nutrients and oxygen for the heart, whose cells begin to perish, and this leads to a heart attack. 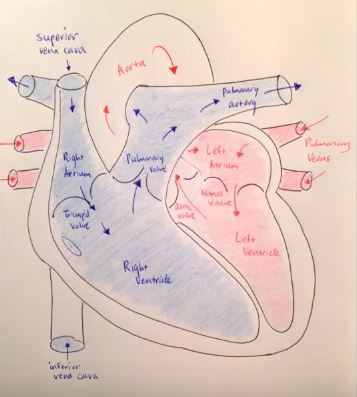 Summary: What are the 14 steps of blood flow through the heart? Blood flows through the heart in the following order: 1) body –> 2) inferior/superior vena cava –> 3) right atrium –> 4) tricuspid valve –> 5) right ventricle –> 6) pulmonary arteries –> 7) lungs –> 8) pulmonary veins –> 9) left atrium –> 10) mitral or bicuspid valve –> 11) left ventricle –> 12) aortic valve –> 13) aorta –> 14) body. This reminds me of the heart surgery I got five years ago -great stuff you do here on this site! Just showed this to my wife, and she loved the pick-up line in your article. Thank you Percy for sharing! Your comment warms our hearts. We’re glad that your wife enjoyed our pun-ny pick-up line. 😀 We wish you great health and happiness! Take care. ❤ Good night to you too, my friend Peach! Nice article! This helps me understand the heart a lot better! I guess you could say that I “lub” it! Thank you, Bird! We enjoyed your Life Science Facts and Telescope posts as well! Looking forward to more, happy holidays.